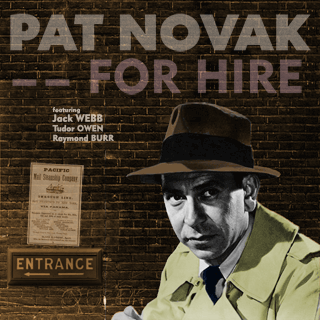 Pat Novak for Hire aired from 1946-48 on KGO Radio, and1949 on ABC Radio. The show begins with Novak talking about the sign he put out, “Pat Novak for Hire,” and then the soliloquy turns into a discussion of what a forsaken hole the San Francisco Waterfront is, and how lowdown corrupt and awful everyone and everything around Pat Novak is. Novak is then approached by someone who offers him an unseemly sum of money to perform an apparently mundane task. Novak is suspicious of the offer but when pressed agrees to take it against his better judgment because there’s money involved. Novak heads out to a location where he meets up with and mouths off to the wrong person landing him flat on his back unconcious. When he awakes, there’s a dead body beside him. Within a minute, he’s nose to nose with Inspector Hellman, who promptly threatens to prosecute Novak for murder. Novak and Hellman then trade insults, and then fearing for his life (back in the 1940s, you didn’t have seventeen years worth of appeals on death row) Novak looks up the “only honest guy I know, an ex-Doctor and a boozer by the name of Jocko Madigan. A good guy… ” at which point Novak makes a witty remark about Jocko being a drunk. Jocko waxes philisophical about how Novak got himself into the mess, declaring Novak hopeless, but still agreeing to help, Novak cajoling him all the way. Jocko is off to question witnesses and research public records. At some point along the way, Novak runs into a woman who says Hello in a seductive voice. Odds are that she’s a manipulative sociopath. In the middle of the case, Hellman will either call Novak on the telephone or taunt him in person and reveal some aspect of the police’s investigation. Jocko will gather some information. And either Novak or Jocko will put it all together, and once the dead bodies are all in the morgue and the surviving suspects are locked up, Inspector Hellman will have only one question and Novak will provide his sarcastic answer to end the episode. That said, Radio Fans of the era loved Webb as Pat Novak. Breen left KGO and Webb with him. In 1947, KGO and ABC believed it could carry on Pat Novak without Novak and without writer Richard Breen. Letters poured in demanding that Webb be brought back, and in 1949 that’s just what happened. What makes the series memorable? Two things. First, the dialogue was rich. As Novak (and Madero) Webb delivered hilarious and rich similes, and transformed the put down into an art form. Jocko Madigan’s soliloquies ranged from the sublimely wise to the hilarious. The show carried a sense of free verse poetry rarely match in old time radio. Secondly, the show had flashes of brillance. When Webb and Breen began their work on KGO, Webb was 26, Breen was 28. They were on the verge of success. Webb was three years away from creating the police procedural drama that would redefine the genre. Breen was three years away from his first Writers Guild Award Nomination and seven years from an academy award. In Pat Novak, the potential and promise of two young men on the verge of greatness shown through, particularly with the occasional departure from the show’s formula. And while Pat Novak was hardly Dragnet for Private Investigators (i.e. a portrayal of what real life is like,) Novak was far more real than many of his hard boiled counterparts like the unflappable Sam Spade. Novak is one of the most quotable radio shows out there. A couple websites have created a compendium of quotes. Here is a great index of Pat Novak Quotes. Also Digital Deli has several quotes on its Pat Novak and Johnny Madero pages. Pat Novak: Novak rents boats and takes private investigation jobs on the side, serving as a body guard, hunting down missing persons, deliverying packages while dishing out sarcasm and colorful metaphors. Novak spends a portion of most episodes unconscious. Early episodes portray Novak as a complete anti-hero. In the only surving episode from the 1946 season, Novak declares his aversion to paid murder only because of the consequences. However, later episodes often a portray slightly more noble impulses, such as when he gets himself in a jam helping a friend out with no hope of being paid for his trouble. Jocko Madigan: Other than an occassional bout of induced unconciousness, Jocko’s drinking seemed to provide little impairment. Indeed, in early episodes, Jocko had more to do with solving the case than Novak himself which led me to hypothesize that Hellman only accused Novak of murder to get him to bring Jocko in. Jocko is not without precedent in the fiction of the era. In a 1942 edition of Ellery Queen magazine, Anthony Boucher (who would later write Sherlock Holmes Radio plays) created a wino detective named Nick Noble, a police detective who responded to tragedy by crawling into a bottle. However, his alcoholism didn’t dimnish him as a detective. The police would make their way to the bar and bring their hardest cases to them. For his part, Boucher couldn’t remember in later years where he came up with the idea of a “wino detective.” However, Mystery Award Theater did a presentation of “The Screwball Division” and the host suggested an exotic origin: Ancient Greece and the Oracle of Delphi. In the ancient world, particularly complex problems were brought to the Pythia who was basically believed to be intoxicated by the fumes coming up from the ground where she sat. In the same way, Jocko Madigan provides insight and clearheadedness despite his state of intoxication. Inspector Hellman: Hellman was on the receiving end of some of Novak’s greatest verbal attacks. Hellman made up for it, as several times he put the beat down on Pat Novak. He constantly fingers Pat Novak as the killer and is constantly proven wrong. Beyond his tendancy towards physical violence, Hellman is a hard figure to peg, because the descriptions are left up to the president of the Cynic Society, Pat Novak. While we never see it, Novak alleges several times that Hellman pockets cash by robbing murder victims. Novak suggests that several times Hellman is an incompetent idiot, but others declares that Hellman is “too smart of a cop” to fall for this scheme or that. Was Breen clever enough to give us a cynical protagonist who projected his cynicism on to others? Was Hellman really a cop in a hurry who’d pin a murder rap on anyone or was Hellman really just giving the wayward detective motivation to solve the case for him. A series of three low budget films starring Hugh Beaumont (best known as Ward Cleaver) as hard-boiled San Francisco PI Dennis O’Brien. 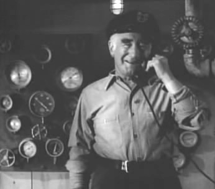 O’Brien works at a boat shop and troubleshoots for hire. He’s got a drunk sidekick…Is this starting to sound familiar? Many reviewers list the movie as a take-off on Pat Novak for Hire. In reality, the films were based on Johnny Madero, however with the Dipso character re-inserted. Claire Underwood hires San Francisco private-detective Dennis O’Brien to purchase a saxophone case at an auction, and O’Brien is promptly slugged and the case is stolen by Larry Dunlap. The other plots from these three films don’t match up with the other circulating episode, Pete Sutro so those three films may provide a clue to what was in some of the lost episodes of Johnny Madero. 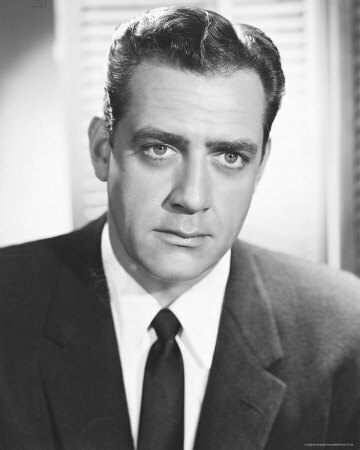 Speaking of up and coming stars, at 32, Raymond Burr was one of several actors who played Hellman. . Burr not only did duty as Hellman, but also played a sea Captain and filled in for the announcer on one occassion. In late 1949, Burr would join Webb on Dragnet as Ed Backstand, Chief of Detectives. The quality of his voice was such that he could play a police officer who’d been on the force for 25 years even though Burr himself was only 32. As Backstrand, Webb stole the show on Dragnet. He was just a few years away from TV Superstardom. While he appeared in the Dragnet pilot, Burr’s biggest role was as Perry Mason. He won Emmys for the role in 1959 and 1961. In addition those Emmys, Burr was nominated for six other Emmys and two Golden Globes for his roles as Mason and Wheel Chair Bound San Francisco Detective Robert Ironside. Other famous roles for Burr included Lars Thorsen in Rear Window and American Reporter Steve Martin in the several Godzilla movies. After taking a 19-year break from playing Perry Mason, Burr brought the character back for a series of 26 popular mystery movies from 1985-93. Eightteen years after Ironside it, Burr filmed a revival of that series as well, which aired in 1993, the year Burr died at the age of 76. Jack Webb: After leaving KGO in 1947 along with Breen, after Breen had a falling out with KGO management, Webb went to Hollywood. Along with playing Johnny Modero on the Mutual Broadcasting System in the Summer of 1947, and Jeff Regan Investigator on CBS in 1948, between his two stints on Pat Novak, Webb played bit parts in several radio dramas including Suspense, The Whistler, and Escape. In many of these appearances, he played underworld figures or bit parts. Webb also began to take on a few movie roles and it was on the set of He Walked by Night that a police officer acting as technical advisor to the film let Webb have it over the lack of realism in Detective Shows, including Novak and suggesting a show that portrayed was policework was really like. This eventually led to the creation of Dragnet on radio and later on television. Both on radio and television, Webb’s realism drove the success of the program. On radio, Dragnet provided not only a realism about the way police operate that had been missing, but Webb enhanced the radio experience with a five-person sound effects staff that made listeners feel as if they were riding along with Joe Friday and his partner. Dragnet became a top-rated show on television, making the jump to TV in December, 1951. Dragnet spawned a Movie, a Comic Strip, and even a board game. Dragnet ran out of gas in 1959 after more than 300 episodes and other Webb efforts met with mediocre success at best. After a failed tenure at Warner Brothers Television in the early 1960s, many thought was done for, but in 1967, Dragnet came back with gusto for a four year run that has often been described as campy. The show dealth frequently with the risks of drugs, with Friday pushing back against hard against the counter culture. While he was making Dragnet, Webb launched two other series that would be remembered as TV Classics: Adam 12, which realistically portrayed patrol officers in the same Dragnet had detectives and Emergency, which focused on the work of paramedics. When Webb died in 1982, the police badge number 714 of Joe Friday was retired. The Los Angeles Police Historical Society created the Jack Webb Awards in 1994 to honor lifelong committment to law enforcement. Log information provided by Digital Deli. The most amazing thing about “Pat Novak” is how the show deftly manages to walk a tightrope between brilliances and absurdity. Each episode is a cut-from-the-mold mishmash of maladroit thugs, predatory women, banal cops, and small-time megalomaniacs all held in precarious unity by Novak’s overheated dialog and Jocko Madigan’s booze-induced existential probity. Does it work? Like gangbusters. Goodnight, lover! Very nicely detailed info on Jack Webb and Richard Breen. This is the first I’ve hear of Breen. He was the silent partner of Webb. The Jocko speeches were certainly written by a great wordsmith. And Tudor was the perfect actor to deliver them. Indeed, the Pat Novak series was wonderful. Thanks for sharing! This is a pithy, informative and elegantly written essay on Pat Novak — For Hire. And much like an oasis in a desert as the show and info is a mysteriously well hidden secret. First heard it on Great Detectives having tuned in for specific shows. When this rolled by, was dozing off to sleep. Not for long, I crashed awake not believing what I’d been hearing, putting the dialogue down to a surrealistic twilight illumination of the gods. Getting up to re-run the show crossed a Rubicon and now it’s a passion. Jack Webb and everything about the show is unique. Richard Breen’s writing…everyone here has said it already. Jocko must be the most sublime wordsmith on the airwaves. Serendipity; treasure trove! Big thank you Adam. Curious about the last episode of Pat Novak, and the reworking of it for another Webb’s other show Pete Kelly’s Blues. Just wanted to know if you had any stories about that? Only recently discovered the podcasts and have been listening daily to Pat Novak. In the Agnes Bolton episode, Hellman tells Novak, “Your shikker was here checking fingerprints.” Wondered if you realized that’s Yiddish slang for drunkard. Just started to enjoy these great Jack Webb shows, and heard a great line in the “Fleet Lady” episode. About mdway through, when Pat and Jocko part ways, Pat says ” After I left Jocko, I went to the (unintelligable) morgue, and looked up the NBC Program Director Paul Stangel…” And you can then hear Jack trying to suppress a laugh. Had to go back and listen again and make sure I heard it right. And maybe that was what cracked up the announcer and crew during the closing credits ! Keep up the great work, Adam! In “The Lydia Reynolds Case” the person playing Novak sure sounds like J. Scott Smart. Does anyone know if he may filled in for Ben Morris on this episode? Pingback: The Art of the Hard-Boiled Simile | Ginger IS The Professor!